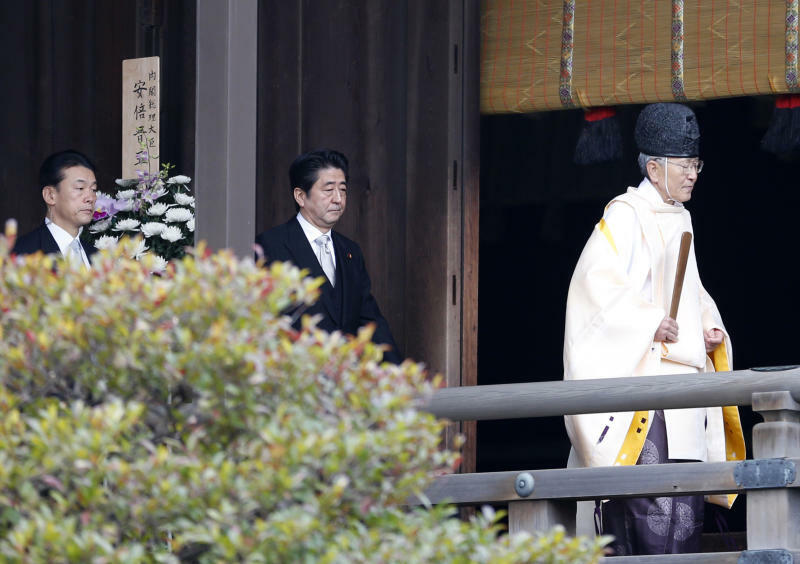 TOKYO (AP) — Prime Minister Shinzo Abe paid his respects Thursday at a shrine honoring Japan's war dead in a move that drew sharp rebukes from China and South Korea, who warned that the visit celebrates his country's militaristic past and threatens to further sour already bad relations. The United States expressed disappointment "that Japan's leadership has taken an action that will exacerbate tensions with Japan's neighbors." Abe, a nationalist who advocates revising Japan's pacifist constitution, has always wanted to visit Yasukuni as prime minister, but his visit still surprised some analysts, who thought he might take a pragmatic approach to leadership that focused on reviving the economy and trying to avoid alienating neighbors. "I prayed to pay respect for the war dead who sacrificed their precious lives and hoped that they rest in peace," he told waiting reporters afterward. 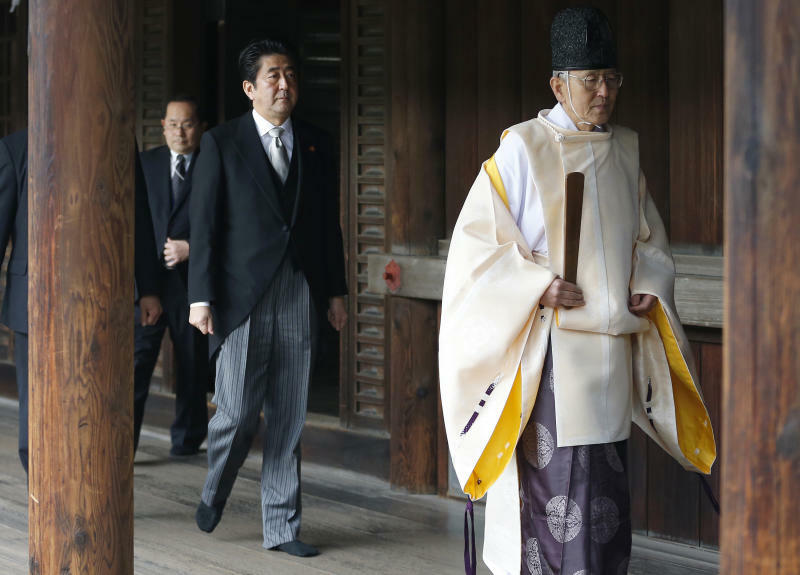 "Unfortunately, a Yasukuni visit has largely turned into a political and diplomatic issue," he said. "It is not my intention to hurt the feelings of the Chinese and Korean people." He said he believes Japan must never wage war again: "This is my conviction, based on the severe remorse for the past." Chinese Foreign Ministry spokesman Qin Gang, in a statement posted on the ministry's website, said "we strongly protest and seriously condemn the Japanese leader's acts." 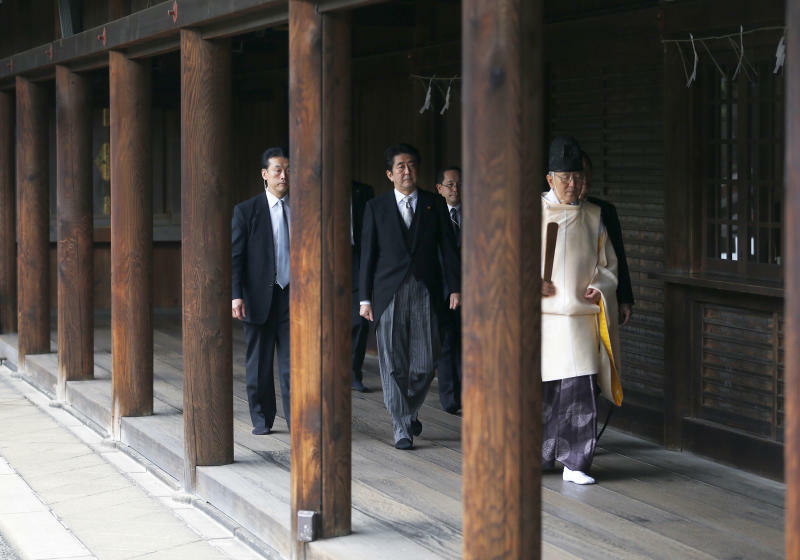 He called visits to Yasukuni "an effort to glorify the Japanese militaristic history of external invasion and colonial rule ... and to challenge the outcome of World War II." He added that "the effort to go against the historical trend is sure to cause great vigilance and strong worries among Asian neighbors and the international community over the direction of Japan's future development." South Korea's minister of Culture, Sports and Tourism, Yoo Jinryong, labeled the visit "an anachronistic act" that "hurts not only the ties between South Korea and Japan but also fundamentally damages the stability and cooperation in Northeast Asia." His briefing was broadcast live on TV. A statement released by the U.S. Embassy in Tokyo took note of Abe's expression of remorse, but said "the United States hopes that both Japan and its neighbors will find constructive ways to deal with sensitive issues from the past." Thursday's visit came on the first anniversary of Abe's taking office as prime minister. He visited previously when he was not prime minister, but not during an earlier one-year term in office in 2006-2007. Adding to the unease of Japan's neighbors is Abe's push to expand the military at a time of rising tensions over a cluster of uninhabited islands in the East China Sea claimed by both Japan and China. "I think we know where his beliefs lie," said Nakano, a professor at Sophia University in Tokyo. "He's not in politics because of economics. He's a conviction politician just like Margaret Thatcher was. Pragmatism and conviction don't go very well together."